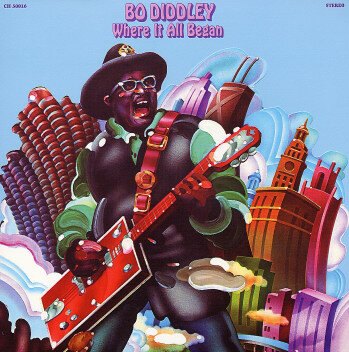 Further to my previous post and to the best of my knowledge, apart from the "Big Bad Bo" album (Chess CH-50047) released in 1974, the only other Bo Diddley album to be partly recorded/remixed at Sound Exchange was his 1972 funk/blues heavy "Where It All Began" (Chess CH-50016). Produced by Johnny Otis & Pete Welding and with Chess Records' Esmond Edwards as executive producer, the album was mainly recorded at Eldorado Recording Studio in Los Angeles, CA in late 1971 and into January 1972, with some additional recording at Sound Exchange and at Aragon Recording Studio in Vancouver, BC, Canada. By late 1973, Chess Records had closed down their famous offices and studios in Chicago, IL and moved all remaining operations to New York. During 1973 and 1974, with your late father Skip as chief engineer and Esmond Edwards in charge of production, Sound Exchange was to be the location for the remainder of the Chess recording careers of Bo Diddley, Chuck Berry and Etta James. All the tracks on Chuck Berry's final 2 albums for Chess - "Bio" (Chess CH-50043) released in 1973 and "Chuck Berry" (Chess CH-60032), released early 1975 - were recorded at Sound Exchange and I'm pretty sure that at least some, if not all, of the tracks on Etta James' final 2 Chess albums: "Only A Fool" (Chess CH-50042) released in 1973 and "Come A Little Closer" (Chess CH-60029), from 1974, were also recorded at Sound Exchange. (The late Bo Diddley's authorised webmaster). Join in and write your own page! It's easy to do. How? Simply click here to return to Bo Diddley Recording Sessions.